What fun to find Dana Nuccitelli’s dirty little secret (WUWT, Andrew Neil (BBC)) that he is now at pains to play down. Apparently he works in contaminated land cleanup. When funding sources for CRU and others were exposed in the Climategate emails, climate scientists’ links with Big Oil came to light. I did think at the time that this may have played a large part in the development of the ‘sceptics are funded by Big Oil’ meme. If Big Oil had that much money to throw at climate science research, how much more would they be secretly pouring into efforts undermining it? I’ve since realised that there’s another mindset driving the meme. It’s the ‘anti’ stuff. You see climate sceptics tend to side with the anti-wind and anti-renewable energy lobby (because so much of current policy is ludicrous and costly). So many of the environmental arguments for policy change are ludicrous and sceptics are only too happy to ridicule them. And here’s where the mindset comes in. You see the Green Movement feels it is inalienable in its stance, and anyone critical of its pronouncements must be anti-environment. Big Oil is anti-environment and uses all these arguments. So if sceptics use the same arguments they MUST be getting them from Big Oil, because no-one in their right mind would be critical otherwise. They cannot perceive that others see actual, genuine flaws in Green Policy. Ethanol mandates have caused US corn prices to rocket from $1.96 per average bushel in 2005 to as much as $7.50 in autumn 2012 and $6.68 in June 2013. Corn growers and ethanol makers get rich. However, soaring corn prices mean beef, pork, poultry, egg and fish producers pay more for corn-based feed; grocery manufacturers pay more for corn, meat, fish and corn syrup; families pay more for everything on their dinner table; and starving Africans go hungry because aid agencies cannot buy as much food. Having said I felt it (food vs fuel) was a legitimate concern, he quietly talked through a lot of the arguments with me. I wish I had taken notes, but a couple of things did stick in my mind. Having done some fact checking I have accepted that a lot of his arguments were sound, or at least had more merit than I’d given them credit for. But I digress. That conversation got me thinking about the rocks tossed at sceptics. It’s a bit like that phrase, you know – “the enemy of my enemy is my friend”, but a sort of twisted version. If you are ‘anti’ something, you are taken to be ‘anti’ it for the same reasons as everyone else who is ‘anti’ it, as some of your arguments are the same even if your reasons are different. So I guess the thinking goes – if Big Oil is anti-ethanol and is funding disinformation campaigns, and climate skeptics come out as anti-ethanol, it stands to reason they must be funded by Big Oil. In the strange world of Green Thinking, only their opinions count. So it is perfectly OK for Mr Nuccitelli to work for a large private corporation with significant operations for and with the fossil fuel sector; his conscience is clear. However, Barry Woods on Twitter was right – sceptics with even the remotest connections to such industries would be lambasted for less. It is the pot calling the kettle black. Josh hits the nail on the head once again. 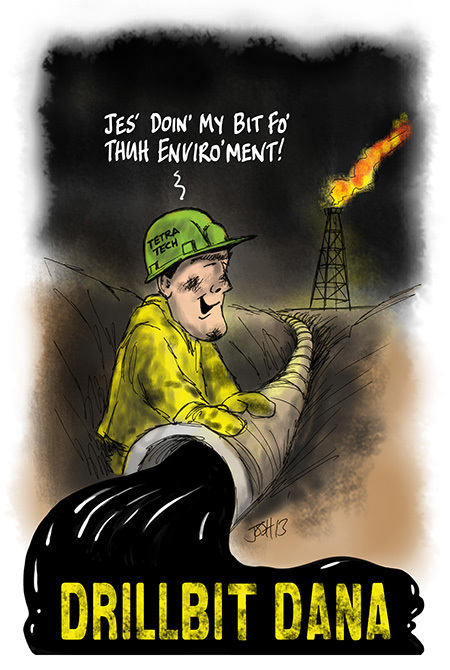 This entry was posted in Environmentalism, Humour and tagged Big Oil, Cartoons by Josh, Dana Nuccitelli. Bookmark the permalink. That’s because pond scum has a more accurate, more consistent moral compass than any environmentalist infused with the moral clarity of Gaia devotion can ever have. Poor Dana doesn’t like being on the receiving end of “‘you guys’ generalizations,” and yet he’s more than happy to dish them out. It’s very interesting to see the tables turned. Perhaps we could consider implementing a system such as “bonding” whereby bloggers and commenters get certified as “not affiliated with any Big (fill in the blank).” Everyone else has to list their Big Whatever’s affiliation. Surely there’d be just as many accusations of lack of ‘hiding’ affiliations and failure to declare. Happens all the time in our parliament. PRI and its partners developed power conversion technologies to enable commercial exploitation of resources heretofore of no commercial value. These power conversion technologies permit the Institute to offer turnkey solutions which exploit thermal resources with temperatures from 70oC to 200oC, hydrologicheads from 2 – 30 meters, and wind speeds averaging more than 5 m/sec. PRI’s Solar Gradient Pond Plants produce power at $ 0.032 /kwh, while the it’s combined Wind/Solar plants produce power at $0.0265 /kwh, and it’s 100 Mwe Geothermal Plant will produce power at $ 0.014 / kwh. In contrast, the competition’s petroleum fueled plants produce power at $ 0.29 /kwh or more than 12 times more, and their coal plants produce power at $ 0.09 /kwh or nearly 5 times more ! No, we don’t need those useless alternative energy sources, eh? Everyone loves alternative energy when it is appropriate and cost effective. The trouble is that most such solutions don’t “Scale” well. You soon run out of space. Hi transitionfromoil. Unfortunately there is no such thing as low carbon biomass. Wood is the highest carbon fuel there is and generates less heat per tonne than all the other hydro-carbon fuels. It also contains a lot of moisture which is either removed before combustion requiring energy or during combustion lowering further efficiency. When it comes to the numbers, the real numbers a Utility needs to justify investing in burning the least efficient fuel on the planet, they need to know that they will get a return, and for you and me that means higher prices. And here is the conundrum. You want us to pay more for our electricity to save what? ?